Roof Mold Removal is possible! Did you know 50% of roof shingle replacements could be avoided. Tons of landfill waste prevented. The black Algae streaks seen on the north side of a shingle ( or Tile ) roof are the result of an overgrowth of black algae. Eliminate the roof mold stains with a simple soft wash using either of two premium roof cleaning chemicals : Roof cleaner QSE or Roof Cleaner OX that eradicate roof mold and algae restoring your home's curb appeal. Replacement or routine shingle care? 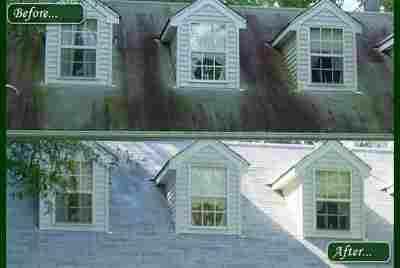 Roof mold, lichen, mildew and algae cause black streaks and roof stains that can result in premature asphalt shingle failure. Replacing an asphalt shingle roof costs over $10,000, but a weekend roof cleaning project costs under $150 as DIY project. After eradicating roof mold and restoring your home's curb appeal. 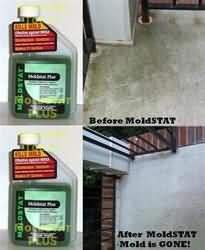 The algae wants your roof back..
MoldSTAT product line offers mold cleaning solutions for black mold (actually any color mold) including mold spore problems as well as a Mold Prevention Spray. Trust only an EPA registered Mold Killer to penetrate into the hyphae / roots of mold and mildew. Explore mold removal solutions in our Mold Removal Products department. 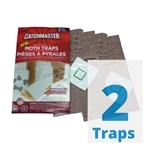 Great solutions to eliminate mold, at fair prices! Find out more about using mold removal products by visiting our Mold Removal Products FAQs and common mold and mildew remover application and use articles. Many of our customer have had the same problems you face. Read Mold Removal Product Reviews to learn from their experiences.